The rising popularity of Warsaw as a tourist destination calls in question the common opinion that European post-communists cities are dull, grim and predictable. Warszawa, the unfading metropolis, marked strongly by history, and placed firmly in the present, holds many surprises to any curious traveler and encourages to come back for more. The historical heritage allied to the political changes the country has undergone in the modern times, the liberalization of economy and the privileged central position in the region are turning Polish capital into the nerve centre of business for Central and Eastern Europe. In 2012, the 200 square miles of Warsaw could muster 56 museums, 170 hotels, 1518 historic buildings, 120 miles of bike lanes, 1500 restaurants and pubs, 8500 taxi cabs and a staggering number of 300.000 students (one out of 6 of Warsaw’s citizens is a student). Whether a tourist tired of following the beaten touristy tracks, or a business person looking for new opportunities, come visit Warsaw and be dazzled and puzzled by this city of contrasts. Warsaw public transportation works well – especially the recently constructed Warsaw metro. See map of the Warsaw Metro. As per summer 2012, a one way metro ticket to any Warsaw metro station was 2,80 PLN (approx. 50 pence). Many tourists and business visitors chose to travel by taxi when commuting for a limited number of days in Warsaw. Taxi rates in Warsaw are reasonable. Expect some £8-12 (43- 55 zloty) for the 20-30 minute ride from Warsaw city centre to Warsaw-Chopin International Airport. If you would like, however, to get to know Warsaw and Warsaw´s surroundings thoroughly and at your own pace, you may find booking a Warsaw rental car during your visit in the Polish capital more convenient. The car hire offers in Warsaw are competitive and the city´s layout invites for driving. The communist architecture, famous for its love of wide avenues, is present pretty much everywhere except for in the strict historic centre of Warsaw. At the time of the reconstruction of the city after World War II there was not really much limitation of space. As a result the imposing 2, 3, or even 4-lane roads link many important locations in Warsaw. The areas in between are a rather regular grid of parallel and perpendicular streets making it quite easy to travel in a Warsaw hire car. 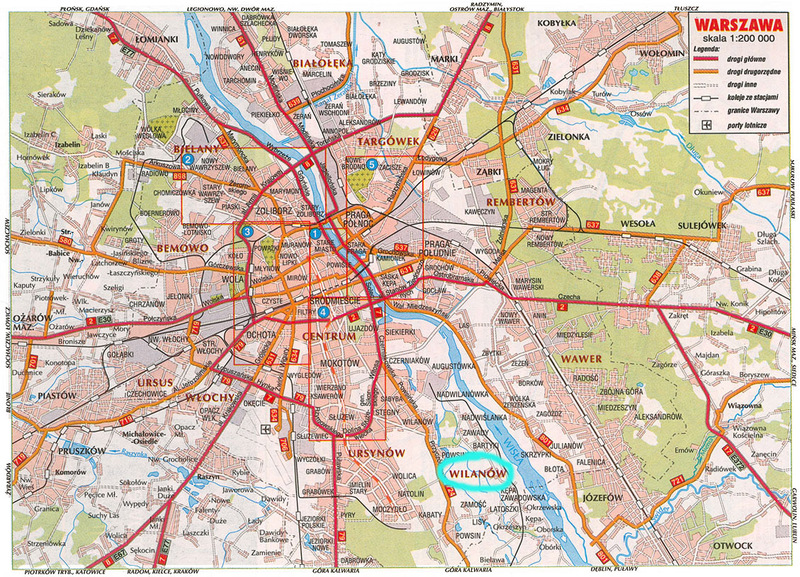 See map of Warsaw city centre. Parking in Warsaw is relatively easy and inexpensive. During weekdays between 8 am to 6 pm, Warsaw city centre street parking is charged at an hourly rate. The remaining time, it is free of charge, including in weekends and on public holidays. Daytime parking in Warsaw is usually charged at between 3 PLN and 4,20 PLN per hour (summer 2012). In June 2012, one Polish zloty (PLN) was approx. £0,20 (GBP) or €0,23 (EUR). Near hotels and places of tourist interest public parking lots are available, and usually visitors have to pay for parking here all days of the week. Most of the established car hire companies offer their services in Warsaw City. You will find Avis Rent-A-Car, Europcar, Budget Car Hire, Hertz, Alamo and Dollar Thrifty in the Polish capital, as well as local renters: Express Rent-A-Car, INCAR 24 and SilverCar. Rental cars in Warsaw can be picked up in different locations in the city centre and at both Warsaw airports. Chopin International Airport in central Warsaw is by far the largest airport in Poland. See more about Warsaw Airport car hire. ModlinAirport is the low-cost airport of Warsaw and was inagurated in 2012. See more about Warsaw-ModlinAirport car hire. Car hire rates in Warsaw are quite competitive, but it is always a good idea to research thoroughly the rental offer on the internet before booking. The best Warsaw car hire deals are usually to be found on the net, and booking online well in advance prior to large conferences, sport events and main holiday seasons in Poland often secures a better deal. Which car rental station in Warsaw? In Warsaw city center, you find the car hire companies Express Rent-A-Car, Hertz, Sixt and Avis. All of them are within walking distance from Warsaw main railway station opposite the Palace of Culture and close to the Forum Hotel. The city Avis Rent-A-Car station in Warsaw is situated in the lobby of the Marriott Hotel. The cars are parked underground and mainly on booking request. Another Avis rental location can be found at the Avis HQ at ul. Łopuszańska not far from the airport (mainly Avis van rentals). A bit further out towards Ochota, at the Radisson Blu Sobieski Hotel, the Warsaw city Europcar station is to be found. Sixt Car Hire Warsaw (city) is located at Emilii Plater street in the Warsaw Continental Hotel. The majority of car hire in Warsaw takes place from either Warsaw-Chopin International Airport or the low cost airport in Modlin. All major Warsaw car hire companies have offices in the airports. You may get slightly confused when driving in Poland for the first time by the green arrow sign on pretty much every crossing. When at a red light, the green arrow allows you to turn right as long as priority is given to the pedestrians crossing and no cars are approaching from the left. This permission to turn right at some red traffic lights in Warsaw is also referred to as a Green Filter Arrow. Driving a hire car in Warsaw, you will be pleased to know that pedestrians in the Polish capital are rather ruly and crossing the busy avenues without having a green walking light is not common. You should, though, pay special attention to the many bikers in the Polish capital. Flat-terrained Warsaw has developed a superb net of cycleways, and the bikers are many and serious ones. Even if you cannot see any bikers on the bikers crossing, always stop for the red light and check again, as they may appear, at a great speed, out of nowhere. In the past, many visitors to Warsaw would be rather unpleasantly surprised by the poor quality of roads in the city. Driving in Warsaw would sometimes become a challenging game of avoiding deep holes in the street surface or rails left by tracks. The maintenance level has improved – especially in Warsaw, but it is still advisable always to slow down before rail crossings in Poland as the risk of damaging your car is high if taken at speed. Fortunately, nowadays, the heavy cargo traffic has been pushed out of Warsaw city centre and with the huge investment done for the EURO 2012 Championship hosted by Poland and Ukraine, the quality of many main roads in Warsaw has improved considerably. Still, do not be surprised by the sudden jerking of the car in front of you. Most likely you will be forced into the same motion if the road has not been repaired for some time. Lowering speed is essential to protect your vehicle. Poland, and the economically booming Warsaw especially, have been gradually upgrading its car fleet. Nowadays, more people own cars, and the cars driven are newer, better and faster. The general speed limit for driving in Warsaw of 50 km/h between 5 am and 11 pm and 60km/h during the remaining hours equals 31 mph and 37 mph respectively. Outside of the urban areas, the speed limits are: 90 km/h (55 miles per hour) on a single carriageway and 100 km/hour (62 miles per hour) on a dual carriageway. The Polish speed limit on motorways has increased to 140 km/h (87 mph). See more about speed limits in Poland. Please mind that some Polish drivers may be speeding. The ever present traffic police are ready to issue speeding fines. As in any other capital, the main streets of Warsaw are quite congestioned during week days. The pattern of Warsaw traffic is typical to a major metropolitan area: in the morning people drive from the peripheral residential areas in towards the centre where the jobs are, at the end of the day the other way round. On Friday afternoons the exit roads from the city are to be avoided in all directions. The best time for leisure driving in Warsaw is during weekends and on public holidays. In the weekend and on public holidays, free street parking in Warsaw city centre is another bonus to the much better flow of traffic. See also: Road map of Warsaw. Today´s Warsaw with its over 2.5 million residents is the largest metropolitan centre in Poland and the 10th most populous city of the European Union. The traces of tumultuous past entwine here, not always harmoniously, with the present of a modern, vibrant city. Centuries-old, well preserved architecture of extreme beauty co-exists with the communist era urbanistic atrocities. The state-of-the-art, and fashion for that matter, ultra-modern shopping malls or office centres may cause mixed feelings, but do not really surprise anymore in Warsaw. Aesthetically mismatched, Poland´s capital is without a doubt an intriguing place with many places of historic and cultural interest for the visitor. The absolute must for any tourist in Warsaw is the medieval Old Town, with its Royal Castle, gothic Cathedral and charming and colourful Market Square. You will not be able to drive in those historic surroundings as the Old Town is closed for traffic. 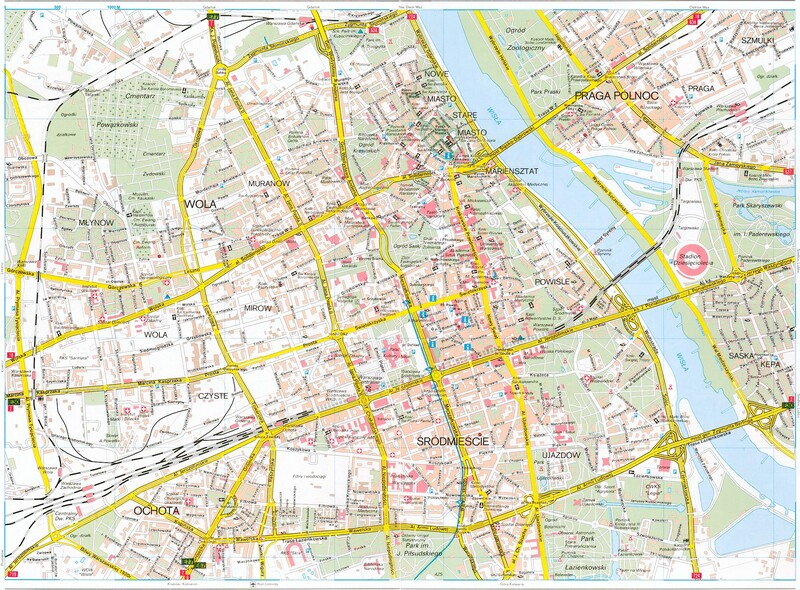 See Warsaw inner city and Old Town map. Warsaw’s most popular street, Nowy Swiat, with shops, restaurants and bars is also available only for pedestrians and public transportation. A car is advised, though, to visit the rest of The Royal Route as is called the road linking the Old Town to the 17th century royal residence in Wilanow – also known as Wilanow Palace. Remember to stop on the way at Lazienki Park for a moment of bliss: squirrels feeding and a ride in a gondola in a beautifully landscaped park, featuring many historic monuments. Getting familiar with the history of Warsaw means getting to know a huge chunk of history of Europe. Do not miss on the unique Warsaw Rising Museum, dedicated to a tragic and rather unknown chapter of World War II. As disastrous as the war bombings was for Warsaw's architecture the communist ruling. You will not really know Warsaw and understand what shaped its people if you don’t see the city's less attractive side: the Stalinist era monuments. Every visitor to Warsaw will know the 231 m and 42 floors high Palace of Culture, the city's most notorious landmark, loved and hated by the Poles. Finished in 1952 as a gift from communist Soviet Union to Warsaw Pact allied Poland, the Pałac Kultury i Nauki or simply PKIN is now hosting exhibitions as well as offices, cinemas, a theater, a conference hall and even a small university. Tourists are catered for on the 30th floor with a terrace overlooking the city. See more about whats on at the Warsaw PKIN. If during your stay in Warsaw you have a hire car at your disposal, it may be an interesting experience to take time to just drive around the city in search of less known examples of communist style: monumental and unpractical at the same time. At any 50 km distance you will be able to home back to Warszawa by aiming for the towering Palace of Culture in the middle of the city. If you need a break from the big city and want to take full advantage of your hire car, many attractions await you within a short drive from Warsaw. Zelazowa Wola, the birthplace of Fryderyk Chopin, Poland´s most famous composer, situated 30 miles of Warsaw is Chopin´s biographic museum. Piano concerts take place in Zelazowa Wola in the summer season. Kampinoski National Park on the north-west outskirts of Warsaw boasts nearly 200 miles of hiking and cycling routes and many endangered species of fauna and flora. The city of Warsaw, Poland's capital, is situated on the banks of Vistula River, in the very centre of the country and in an even distance from other major Polish cities, as Gdansk, Poznan, Wroclaw or Krakow. Moving around Poland in a rental car, upon your arrival in Warsaw might be the best solution. After Poland's joining the Schengen area in 2007, the border crossing control when entering Germany, Czech Republic, Slovenia and Lithuania is no longer necessary. You can expect, though, queues and bureaucracy on your way to Ukraine and Belarus. Poland has been struggling for a long time to develop its road infrastructure. The UEFA Euro 2012 Championship hosted together with Ukraine, has given the long-needed boost to the highways development. Warsaw´s new National Stadium was chosen to be one of the main venues for the UEFA EURO 2012 Football Championship to be hosted by Poland and Ukraine. The whole Warsaw's tourist and transportation infrastructure was put on their toes for the event. The inauguration of a new international airport in a nearby town of Modlin was rushed to receive football supporters from all over the world. See more about the low-cost Modlin Airport. Warsaw car hire. Discover Poland in a rental car. Find out where to rent a car in Poland's capital and how to drive safely and comfortably in Warsaw.